It is no secret that America is in the midst of an opioid epidemic. Recent high-profile overdose-related deaths only underscore this unsettling trend of increasingly powerful and dangerous drugs being prescribed without fully considering the long-term consequences of this approach. Now, to be fair, opioids certainly have their place. Terminal patients and those suffering from extreme, persistent, incurable pain are just a couple of examples of those for whom opiates are a true necessity. At the same time, there are millions of people suffering from day to day chronic pain, from conditions such as osteoarthritis or fibromyalgia who could perhaps be better served through a non-opiate based approach. What does the research suggest as a stand-in for those magic little pills? Why, none other than that panacea of wellness: exercise! Those for whom the risks of opioid use are far greater than the potential rewards: With the side effects of opiates ranging from mild cognitive impairment all the way through to depression, addiction, dependence, and overdose, the decision to take these powerful pills should not be made lightly. Because opiates are physically addicting, patients who take them for any substantial period of time will experience withdrawal symptoms if they stop treatment, increasing the potential for a full-blown addiction to develop in order to prevent withdrawal. Those who want their treatment to go beyond simply “masking the pain”: Opiates are unrivaled in their ability to knock out even the most intense pain signals to the brain, making them excellent first-line treatments for acute accidents or patients with severe, incurable pain (i.e. cancer patients). But for patients who are seeking to truly “get better” and work through their condition, opiates offer no objective benefit. Physical therapists, on the other hand, are trained to help patients increase strength, flexibility, and improve mobility all through the power of guided movement. 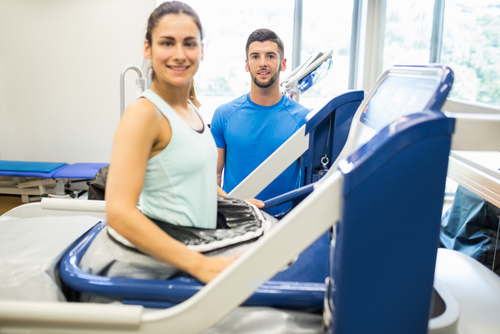 Patients diagnosed with low back pain, hip or knee osteoarthritis, or fibromyalgia: the CDC points to powerful evidence in favor of exercise and physical therapy as the best treatment for these chronic conditions. Low-impact aerobic exercise, such as walking or cycling, or (our personal favorite!) walking/jogging on the AlterG Anti-Gravity Treadmill™. Stretching and flexibility work: some good options for this type of exercise include yoga and tai chi. Resistance training: weight training helps to build up crucial join-supporting muscles, which helps to reduce chronic pain. Patients can use free weights, resistance bands, or even their own body weight to perform resistance training. While the mechanisms behind the efficacy of exercise in pain management still remain somewhat murky (some research points to an increase in natural opioid production, due to exercise), the results are clear: we must get moving to get better. Furthermore, we must consider exercise and physical therapy alongside opiates when assessing what is best for each individual patient’s pain management plan. Opiates are vital to some, but exercise is beneficial to all.